Fabrication of 124 polymer-CNT scaffolds followed by characterization of cardiac tissue constructs on them. (A) Schematic showing the preparation of 124 polymer-CNT prepolymer. (B) Fabrication of polymeric scaffold structures for cardiac tissue engineering. (C) Immunostaining of cardiac tissues against sacromeric alpha actinin (green) and F-actin (red) after 7 days of culture (Scale bars: 20 microns). (D) High magnification of immunostained pictures showing the cross-striations of cardiac tissues (Scale bars: 10 microns). Every year, millions of people around the world experience heart failure. Current treatments rely mainly on surgery and transplants – in part because heart cells (or cardiomyocytes) have little ability to self-regenerate. Tissue engineering aims to support the restoration or regeneration of cardiac tissue – but the approach requires a suitable scaffold on which cells can grow. Researchers from the University of Toronto and the National Institute for Materials Science in Tsukuba, Japan think they have hit on a winning formula based on a polymer, which matches the flexibility of cardiac tissue, combined with carbon nanotubes [Ahadian et al., Acta Biomaterialia (2016), doi: 10.1016/j.actbio.2016.12.009]. The team led by Milica Radisic previously developed a polyester (124 polymer) to match the flexibility and elasticity of cardiac tissue – but the biomaterial is not electrically conductive. To bring conductivity, which would support the electrical signaling capacity of cardiac cells, the researchers added carbon nanotubes (CNTs) to the polymer. One of the other advantages of 124 polymer is that it can be synthesized via a simple two-step polymerization process, during which CNTs can be easily incorporated. The first stage produces a gel into which CNTs can be mixed. The CNT-containing gel can then be molded into any intricate scaffold shape before exposing to ultraviolet light, which sets the gel into an elastomer by creating crosslinks between the polymer chains. The synthesis is easy and reproducible, says Huyer, and enables the mechanical and electrical properties of the CNT-elastomer to be finely tuned. Cardiac tissue grown on the scaffolds with just a very small proportion of CNTs – 0.5 wt% – start beating sooner than that grown on pure polymer scaffolds. 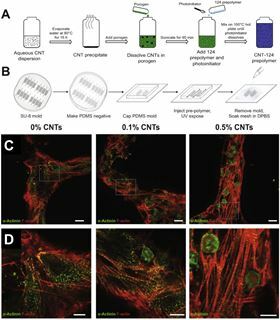 The researchers believe that the 124 polymer-CNT scaffold material could be useful for other electro-active tissues as well, such as neural and skeletal muscle tissue. The only shortcoming of the new scaffold, admits Huyer, is that a higher proportion of CNTs limits the polymer’s ability to crosslink and maintain its shape. To boost conductivity further, therefore, the researchers are now looking to optimize the crosslinking so that the CNT concentration can be increased.